Aviation Week reports that ESA is looking for an alternative launcher for its Experimental Re-Entry Testbed (Expert) after a plan to launch the vehicle from a Russian submarine fell through. 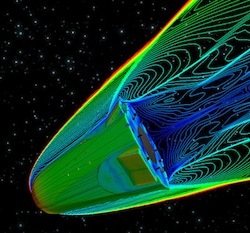 Expert is a ballistic flight re-entry demonstrator that, along with a follow-on Intermediate Experimental Vehicle (IXV), is designed to pave the way for a European reusable space plane. The 450-kg (1,000-lb.) Expert was originally due to be launched in late 2010 on a modified Volna ICBM from a Russian submarine in the eastern Pacific. OHB PR — MT Aerospace received an important follow-up order to manufacture ceramic compound body flaps and heat shield components for the European IXV reentry vehicle: after completion of the development phase and successful Critical Design Review, Thales Alenia Space Italia, as prime contractor, and the Augsburg, Germany based company signed a contract for the qualification and manufacture of the IXV vehicle’s flight hardware. IXV will be launched into space in 2014 to test reentry technologies for future space applications.